While income dispersion significantly increased over the 1990s in most Latin American countries, the 2000s were characterised by a widespread fall in socioeconomic and labour disparities. This column uses a supply-demand framework to explore changes in labour market returns to education in the region. The relative supply of skilled labour rose consistently over the period, while the wage skill premium rose then fell. Supply-side factors seem less important than demand-side factors in accounting for changes in the skill premium, especially between workers with a tertiary education and the rest. Declining Latin American inequality: Market forces or state action? Income inequality dynamics in Latin America have been far from stable. While income dispersion significantly increased over the 1990s in most Latin American countries, the 2000s were characterised by a widespread fall in socioeconomic and labour disparities (López-Calva and Lustig 2010). Recent data for the 2010s suggests a slowing down of the pace of that fall, and even indicates signs of stagnation and reversion in some economies. The mean Gini coefficient for the distribution of household per capita income in Latin America grew at a rate of 0.3% per year between 1992 and 2002, and then it fell 0.7% a year between 2002 and 2010. That decline has substantially decelerated in the 2010s – the Gini fell 0.3% per year between 2010 and 2014, less than half as much as in the previous period (Gasparini et al. 2016). Understanding the drivers of these changing patterns is a difficult task, plagued by all sorts of methodological and data problems. The multitude of policy changes, external shocks, and country experiences imply that there is no single satisfying explanation for these trends, which can be attributed to a variety of factors. In a recent paper, we contribute to the understanding of these complex changes by using the basic workhorse model in economics – the canonical supply-demand framework – to explore changes in labour market returns to education (Galiani et al. 2017). In principle, these changes are important for a simple reason – earnings are the main source of income for most households. On average, they account for 75% of all income reported in Latin American household surveys. Moreover, several studies that apply different decomposition strategies confirm the leading role of the dispersion in earnings, and in particular in hourly wages across skill groups, in accounting for inequality in the per capita income distribution (e.g. Azevedo et al. 2013). Figure 1 illustrates the close relationship between income inequality at the household level and the wage gap between skilled and unskilled labour. Source: own computations based on SEDLAC (CEDLAS and World Bank). HPCI stands for “household per capita income”. In a seminal contribution, Tinbergen (1975) provides a framework to interpret the role of labour supply and demand factors in changes in returns to education. Tinbergen’s discussion is often referred to as “the race between education and technology”, because he postulated that secular technological change would favour the relative demand for skilled labour, increasing its relative remuneration (and thus overall inequality), whereas educational upgrading would provide a counterbalancing force, reducing this premium. This framework has been formalised by Katz and Murphy (1992) and Goldin and Katz (2009), among others. As these authors show, it is possible to simplify the analysis by assuming two factors of production, corresponding to two levels of skills among workers – high and low. Inequality is mainly driven by the remuneration differential between these two groups, the wage skill premium – which in turn is determined by an interaction of the relative supply of high-skill to low-skill workers – and the corresponding relative demand for these two factors of production. In this simple supply and demand equilibrium framework, an increase in the relative supply of skilled workers should result in a decline in their relative remuneration, while a positive change in the relative demand for this type of workers would increase the wage skill premium. Our analysis is based on an extended version of this simple supply and demand equilibrium framework, enriched by partitioning the unskilled group into workers with a high school degree and those with less formal education (Manacorda et al. 2010). This framework is applied to a large database of microdata from harmonised Latin American national household surveys (SEDLAC database). Specifically, we make use of more than 10 million individual observations in 250 surveys conducted in almost all countries in the region over the period 1991-2013. Although there is substantial heterogeneity across countries, some patterns are common to most economies in the region. The relative supply of skilled workers increased substantially and at approximately the same rate over the period under analysis. 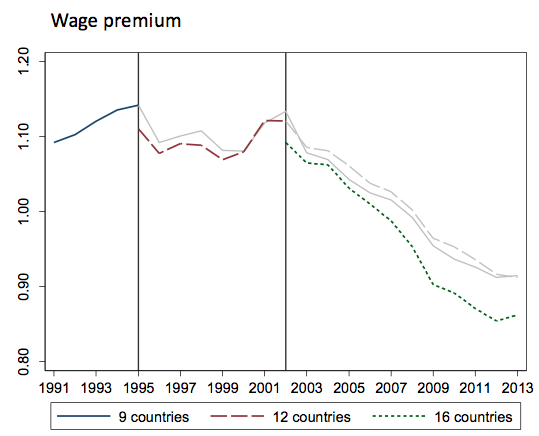 Instead, the pattern for the wage premium exhibits heterogeneity both across countries and over time. The wage skill premium increased for all countries in the region during the 1990s, modestly in some countries such as Brazil, Chile, Costa Rica, Honduras, and Panama, and substantially more in the remaining countries in the sample, especially Argentina, Colombia, Nicaragua, and Uruguay. In contrast, during the decade of 2000, the wage skill premium fell in all countries – the average rate of reduction was about 3.2% per year, twice the size of the average increase in the previous decade. In most countries, the fall in the wage skill premium in the 2000s was enough to offset the increase of the 1990s. 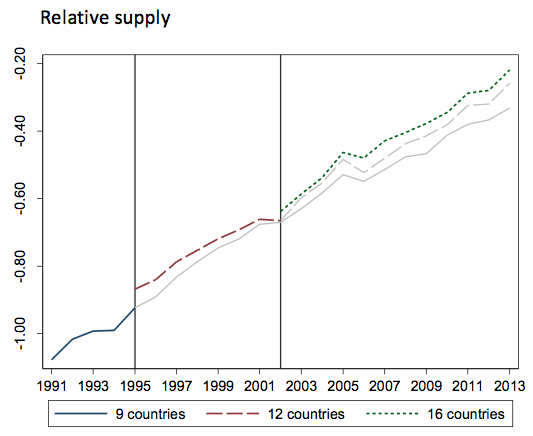 The decline began in the late 1990s in some economies (e.g. Mexico) and later in other South American economies that experienced serious macroeconomic crises (e.g. Argentina, Paraguay, and Uruguay). The reduction in the wage gap continued throughout the 2000s until signs of deceleration showed up in several economies around the turn of the decade. According to our estimates, while the wage premium fell at 3.2% on average in the 2000s, the reduction slowed down to 1.4% per year in the 2010s. Source: own computations based on SEDLAC (CEDLAS and World Bank). Note: “9 countries” refers to Argentina, Brazil, Chile, Costa Rica, Honduras, Mexico, Panama, Uruguay, and Venezuela. “12 countries” also includes Colombia, Paraguay and El Salvador. “16 countries” also includes Bolivia, Ecuador, Peru, and Nicaragua. On average, then, the wage gap between skilled and unskilled workers widened in the 1990s and shrunk considerably in the 2000s and more slowly in the 2010s, in the context of a seemingly secular increase in the relative supply of skilled workers. The patterns in wage skill premiums and relative labour supply are consistent with a positive and strong increase in the relative demand for skilled labour in the 1990s in all countries, as witnessed by the estimates of residual demand presented in Figure 3. 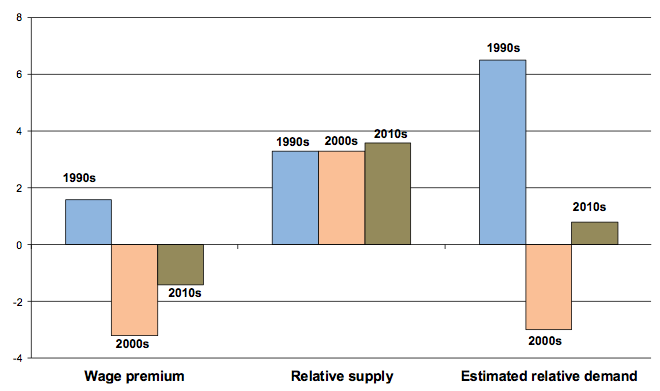 Instead, the estimates of relative demand for the 2000s suggest a reversal in the trends of the previous decade. According to one of our scenarios, relative demand should have increased 6.5% a year on average in the 1990s and should have fallen at 3% in the 2000s. Changes in the 2010s have been much smaller. Source: own computations based on SEDLAC (CEDLAS and World Bank). Note: Estimations of relative demand based on an elasticity of substitution equal to -2. 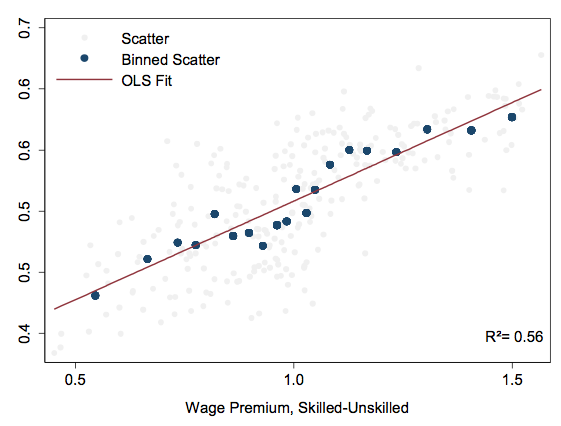 Besides changes in relative remuneration between workers with some tertiary education and those with lower levels of education, the analysis also allows for differentiating within the group of unskilled workers. Our results suggest that, concurrent with a sharp rise in the supply of high school graduates with respect to dropouts, the average wage differential between the two groups fell modestly over time, and more strongly in the 2000s. These patterns are consistent with an increase in the relative demand for high school graduates with respect to dropouts, although at a slower pace than the increase in their relative supply. Although there is considerable heterogeneity across countries, we find a rather constant rise in the relative supply of skilled and semi-skilled workers over the period. Consistent with this pattern, the returns to secondary education completion fell over time. By contrast, the returns to tertiary education display a remarkable changing pattern common to nearly all countries – a significant increase in the 1990s, a strong fall in the 2000s, and a deceleration of that fall in the 2010s. Given this, we conclude that supply-side factors seem to have limited explanatory power relative to demand-side factors in accounting for changes in the wage skill premium, especially between workers with tertiary education and the rest. This finding stresses the need to further our understanding of the changes in the relative demands for skilled and unskilled labour. Azevedo, J P, G Inchauste, and V Sanfelice (2013), “Decomposing the Recent Inequality Decline in Latin America”, Policy Research working paper WPS 6715, The World Bank . Gasparini, L, S Galiani, G Cruces, and P Acosta (2017), “Educational upgrading and returns to skills in Latin America: evidence from a supply-demand framework”, NBER working paper 24015. Gasparini, L, G Cruces, and L Tornarolli, (2016), “Chronicle of a Deceleration Foretold: Income Inequality in Latin America in the 2010s”, Revista de Economía Mundial 43, 25-46. Goldin, C D, and L F Katz (2009), The race between education and technology, Harvard University Press. Katz, L, and K Murphy (1992), “Changes in Relative Wages, 1963-1987: Supply and Demand Factors”, Quarterly Journal of Economics 107, 35-78. López-Calva, L, and N Lustig, (2010), The New Dynamics of Income Inequality in Latin America, Brookings Institution and UNDP, Washington DC. Manacorda, M, C Sánchez-Páramo, and N Schady (2010), “Changes in Returns to Education in Latin America: The Role of Demand and Supply of Skills”, Industrial and Labor Relations Review, 63, 307-326. Tinbergen, J (1975), Income Distribution: Analysis and Policies, North-Holland: Amsterdam.